Permit a heresy: George Romero, director and grandfather of the zombie horror film, never fulfilled the promise of 1968's Night of the Living Dead. With that film, he created frightful genre capable of both startling chills and social commentary. But its sequels simply could not capitalize upon everything that made the original so innovative and captivating. 1978's Dawn of the Dead offered some keen social observations on consumerism with the undead reflexively wandering through malls as if instinct demanded it. But at 139 minutes, the film moved at a pace as slow as the zombies it depicted. With 1985's Day of the Dead and 2005's Land of the Dead, Romero illustrated his apparent belief that the genre's evolution could only be brought about only through the zombie's discovery of his or her own individuality. But the manner in which Romero explored such Cartesian zombie thought processes was as cinematic as a dry academic thesis. In horror films, zombies eat their victims' brains; they realize the potential of their own brains. But the younger directors now trafficking in zombie pictures realized that to make that genre frightening again they must replace the plodding uncertainty of Romero's zombies with a new rage and speed. The notion that slow zombies have lost their scare value is hardly new. Ten years ago, on March 19, 1997, Dennis McLaughlin reviewed the Doctor Who serial, "Dragonfire" on the rec.arts.drwho Usenet newsgroup and asked: "Why do zombies have to move so slowly? Fast zombies are much more likely to capture their prey, aren't they?" Pioneering that new "fast zombie" direction was British director Danny Boyle with 2003's 28 Days Later (which, technically, is not a zombie picture as it depicts victims of a rage virus). 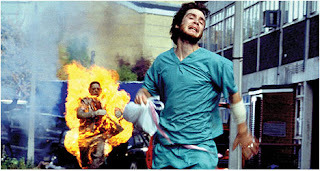 Jim (Cillian Murphy) runs from a fast zombie set afire, in 28 Days Later. 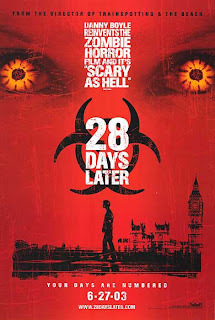 28 Days Later chronicles the effects of a bio-genetically engineered disease, or rage virus, which has ravaged London and turned those it infects into gruesome zombies. As the film begins, Jim (Cillian Murphy, just a few years shy of his role as Scarecrow in 2005's Batman Begins), awakens from a coma four weeks after the disease begins to spread. Finding no one in the hospital, or anywhere else for that matter, he discovers that he may well be alone in London, now an empty metropolis. He, like Tom Cruise in the Times Square sequence of Vanilla Sky, strolls through the vacant city streets and past familiar landmarks. Following the conventions of the genre, Jim stumbles upon other survivors who have banded together in the aftermath of the zombie infestation, including characters played by Naomie Harris, Noah Huntley, Brendan Gleeson, and the young Megan Burns. They attempt to make their way from London to the countryside, where they encounter a number of seemingly friendly military servicemen (led by future star of Doctor Who, Christopher Eccleston). But like most soldiers in such films, they prove to be as much of a threat, if not more, than the undead. By film's end, the group of survivors has dwindled, and there is no clear salvation for humanity. Jim (Murphy) walks the empty streets of London in 28 Days Later. [T]he most haunting moments in "28 Days Later" . . . have little to do with social allegory, graphic horror or cinematic shock tactics. The movie, shot in digital video by Anthony Dod Mantle (who has worked with Dogma 95 disciples like Harmony Korine, Thomas Vinterberg and Lars von Trier), sometimes has an ethereal, almost painterly beauty. The London skyline takes on the faded, melancholy quality of a Turner watercolor; a field of flowers looks as if it were daubed and scraped directly onto the screen. Thanks to Mr. Mantle's images and Mr. Boyle's unexpected restraint, the middle section of the picture, though punctuated by mayhem and grimness, has a pastoral mood, and the actors, unwinding from the stress and panic of London, are allowed to be warm, loose and funny. Today's viewers are are so accustomed to formula that any device that still shocks or startles is welcome. For Boyle and his cinematographer, less is more, which in 2003 was a re-emerging trend in horror and suspense thrillers. Hollywood had rediscovered that what the viewer does not see is far more frightening than any multi-million dollar computer generated monster. Both Alejandro Amenábar, who directed The Others, and M. Night Shyamalan, who did Signs and before that The Sixth Sense understood this principle (although Shyamalan has allowed his initial successes to cloud his judgment in later projects). In 28 Days Later, "the infected," as they are known, are very much like the humans they once were, except for their glowing red eyes, rage, and obsessive hunger. They are like us, and shot on digital video, they are all the more scary for it. Accordingly, Jim's quest to free himself from their clutches is actually suspenseful. In accomplishing that task, Boyle did something remarkable. But, alas, Boyle would not return to direct the sequel, 2007's 28 Weeks Later. 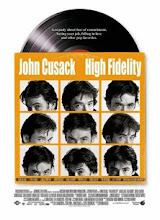 Sticking around only to executive produce that film, Boyle was replaced at the helm by 29 year old Juan Carlos Fresnadillo, then known mostly for 2001's excellent Intacto. But the sequel lacked much of what made 28 Days Later a vibrant success; gone were the stark realism of digital video and the novelty of the fast zombies (which had featured in the 2005 remake of Romero's Dawn of the Dead). Romero, for his part, may have learned his lesson but overcompensated: In February of 2008, he will release Diary of the Dead, an alleged reboot of his franchise featuring the struggle of young filmmakers in a world of zombies. As pleasant as it might be to see zombies descend upon a gaggle of pretentious film majors, 67 year old Romero may be forcing himself to err on the side of the young and hip in a desperate attempt at relevance. Boyle, meanwhile, spent some of 2007 suggesting the possibility of a third and final installment of his franchise titled, of course, 28 Months Later. These days, everybody has to have a trilogy.